THE LEAD: Junior forward Marcus Vela (Burnaby, British Columbia), freshman defenseman Max Gildon (Plano, Texas), sophomore forward Brendan van Riemsdyk (Middletown, N.J.) each scored a goal as the University of New Hampshire men's hockey team tied St. Francis Xavier, 3-3, at the Whittemore Center on Sunday afternoon in an exhibition game. Beginning on Opening Night (Oct. 7, 7:00 p.m.) every home UNH men's hockey game will be streamed live on ESPN3 allowing fans to follow the Wildcats on any device through WatchESPN. - The Wildcats fell behind early after a goal from St. Francis Xavier's Adam Laishram on a backhander at 5:23 in the first period. - Vela redirected a slap shot from Gildon to notch the 'Cats' first goal of the game on a power play at 11:56. Senior forward Michael McNicholas (Manhattan Beach, Calif.) also posted an assist on the goal. - STFX responded quickly when Holden Cook sent a wrist shot from the left face off circle to the lower stick-side corner of the net to regain the lead at 13:05. - The second period went scoreless as the 'Cats outshot STFX 11-5. - STFX's Regan Spears found the back of the net with a wrist shot at 6:23 in the third period. - Gildon notched a one-timer slap shot from the slot off of a pass from McNicholas at 12:05 in the third period. Vela also added an assist on the goal. - van Riemsdyk tied the game off of a wrap around from behind the net at 16:38 in the third period. 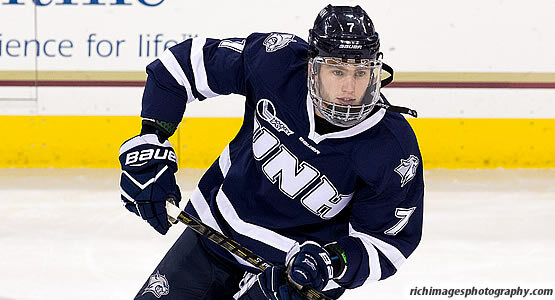 Classmate Liam Blackburn (Prince George, British Columbia) added an assist on the goal. - The game then went into overtime, but neither team could find the back of the net for the 3-3 final. - UNH outshot the X-Men, 33-23. - Senior netminder Danny Tirone (Trumbull, Conn.) made 14 saves in the first two periods. - Senior goaltender Adam Clark (Sherwood Park, Alberta) recorded two saves during his 9:27 of play. - Freshman goaltender Mike Robinson (Bedford, N.H.) recorded four saves during the end of the third period and overtime. - The Wildcats went a perfect 2-2 on the power play while the X-Men went 0-4. - STFX won 33 faceoffs against UNH's 30.